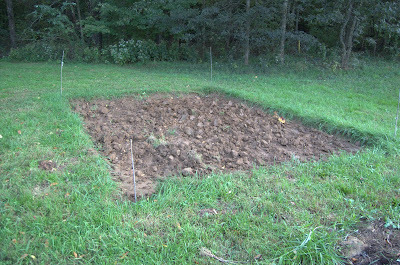 This weekend found me still digging the greenhouse foundation out. Digging out a 10'x16' area by yourself takes some time, especially when it rains more often than not. But in gardening, as in life, you take what comes and do the best you can with what you have. In three digging sessions I excavated three 4'x8' areas to eventually remove all the sod and much of the soil from the area. I still have to clean more soil from the area, dig and level a little more of the area, and add three more corner post holes plus post holes where the doors will eventually go before any serious construction can begin. So here's the result of the "big dig." That was a lot of dirt! Hopefully soon! October is usually one of our driest months but that's proving to not the case this year. I'll do what I can do between the rains and take my time with the greenhouse's construction. I still have some finishing to do on the kids' playset to make it safe and that will need to be done first. I would much rather take two extra months to get this greenhouse-shed done than do something incorrectly. Have you dug any big holes lately?